It was on April 12, 1953 (U.T. 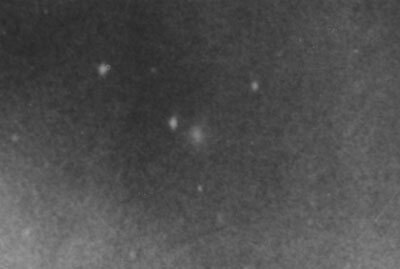 ), many decades ago, when Comet Mrkos-Honda (C/1953 G1) was discovered. This discovery was made following five years of unsuccessful search after he had discovered three comets successively from 1947 to 1948, not long after the end of the war. In those days the discovery telegrams were wired to Japan by Astronomical Telegrams from Copenhagen. Mr. Honda's discovery report was accepted after the initial discovery telegram had been delivered to Japan. This was very unusual, indeed, by the present standard. Mr. Honda discovered the comet 19 hours later than Mrkos and, while he was waiting for a chance to confirm it the following day, the discovery by Mrkos was announced. Mr. Honda's name was added probably because of his past outstanding achievements. This would not have happened, if it had been a discovery made by a rank amateur. As soon as Mr. Honda contacted me, I observed the comet. I remember it was a diffused 9th magnitude comet with a coma approximately 4' in diameter. It was in the constellation of Pegasus, which would rise to the zenith in the predawn sky. Skalnate Pleso Observatory in Czechoslovakia (present day Slovakia) committed themselves to visual comet search in those days. Mrkos and a few other eagle-eyed observers were searching for new comets frantically at an altitude of 1400 meters under ideal conditions. They were so enthusiastic that even Dr. Antonin Becval, director of the observatory, made a discovery by himself. All in all, they discovered more than 10 comets over a period of 10 years from 1947. The famous Comet Tuttle-Giacobini-Kresak was also discovered by Dr. Kresak at this observatory using a comet seeker, almost by chance, in the absence of any predicted positions. CCDs have made comet search easier today, but in those days all the search was done completely visually under extremely difficult conditions. The comet seeker used for the searches at the observatory was 25x10cm binoculars made by Somet-Binar. In those days Mrkos observed at a meteorological station, 1000 meters higher than the observatory. I wonder how beautiful the stars were up there and how cold it was in winter. Back in those days in Kochi, early morning temperatures in winter occasionally dropped to as low as -8 degrees and a mechanical watch ceased to work. And the ability to think diminished too. What still stays in my memory of my observing days in the 1950s in Kochi City are the extreme cold and indescribable beauty of the stars, and the fruitless, futile 10 years. Copyright © 2010 Tsutomu Seki.